This publication from the Committee on Law and Justice summarizes a workshop held April 2018 to discuss how the criminal justice system affects the fundamental status of people as members of society and to consider next steps for research, practice, and policy for the field. The workshop looked at the reasons for the disparate experiences of individuals involved with the criminal justice system by race, ethnicity, and gender, the mechanisms that cause them to persist, and what can be done through policy and practice to minimize those differences. 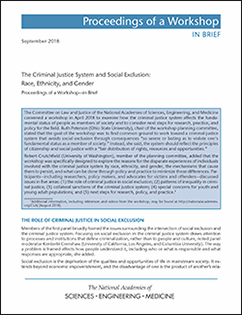 The Committee on Law and Justice held a workshop to discuss the relationship between the criminal justice system and social exclusion, with a special focus on differences across race, gender, and ethnicity. consequences of criminal justice system involvement, broadly defined? felony convictions) contribute to social exclusion of individuals or communities?